This entry was posted in Hazardous materials on 2019/01/23 by Susan. Nanomaterials are so small you can’t see them with the naked eye. A new test makes it easier to detect spills of nanomaterials in workplaces. Engineered nanomaterials are used in the manufacture of many items, including cosmetics, sun tan lotions, toothpaste, fuel cell catalysts, and antimicrobial materials. They can enhance paint colours, for example, and improve the performance of fuel cells. Nanoparticles, for example, are so small that they can pass through the cells and tissues of the human body. In fact, if a nanoparticle of gold were the size of a football, a virus would be the size of a person. It is understood that ingesting, inhaling, or contacting some types of nanomaterials can result in potential adverse health effects. 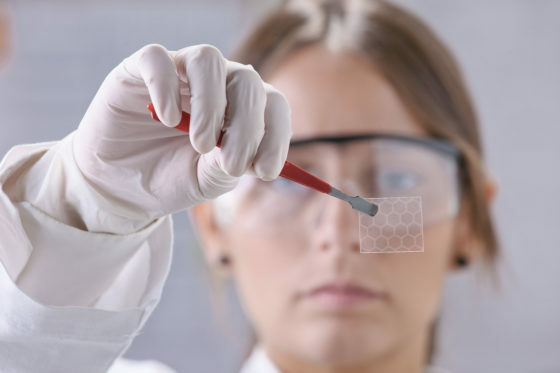 To avoid exposure, workers wear gloves, masks, and other types of personal protective equipment when handling nanomaterials. But given their size, if there is a spill of nanomaterials, it would be impossible to detect individual nanomaterials with the naked eye. Enter a new test developed by Dr. Byron Gates, a professor of chemistry at Simon Fraser University. His portable, cost-effective methods can detect, clean, and sample nanomaterials. Gates’ research and methods were funded by an Innovation at Work research grant from WorkSafeBC. In the past, if people suspected a spill of nanomaterials, technicians had to take samples, send them to labs, and wait for answers. Now, with the new, easier-to-use method, people can get results on the spot. The new test is designed to help those working with nanomaterials, as well as occupational hygienists and other workplace health professionals. Being able to more easily identify when a spill has occurred and having better methods of remediating spills will help prevent the potential for a worker to be exposed. See the Gates Research Group and this 2017 WorkSafe Magazine article, Work Science: Cleaning up nanomaterials, to learn much more about this research. Innovation at Work grants are offered annually, and competitions are open to any Canadian resident with an original occupational health and safety research idea. The deadline for the 2019 grant competition is February 15. For more details, visit WorkSafeBC’s Innovation at Work page.